Home Software What Are The Tools Required For Hand Lettering? In this digital world, people can learn anything and everything sitting in the comfort of their home. Starting from designing to programming, all the courses are available with detailed tutorial to become an expert in them without having to go to a physical coaching class. If you are looking for online lettering classes, there is no better option than Skillshare lettering classes. But you need to have the tools required for your possession to get started. Staedtler Mars Technico – You will need different types of pencils for hand lettering classes. This one is something in between traditional and mechanical pencil. You can get the desired sharpness as you get in a traditional pencil. At the same time, you can change the lead as you can with a mechanical pencil. You can do preliminary drawings and also give final touches at the end. Lead Sharpener – As stated earlier than Staedtler Mars Technico pencils can be sharpened like the traditional pencil and that is achieved with a sharpener. Getting the right sharpness is instrumental for perfect drawing as well as for the satisfaction of the designer. If there is no comfort while drawing, the designer is likely to be distracted and cannot put his full concentration. Felt Pens – Once you are drawing the sketch and the outlines are fixed, you have to use a pen to ink the design so that it becomes vibrant and clear. You can use them to do outlining, filling, and drawing repetitive patterns and much more. 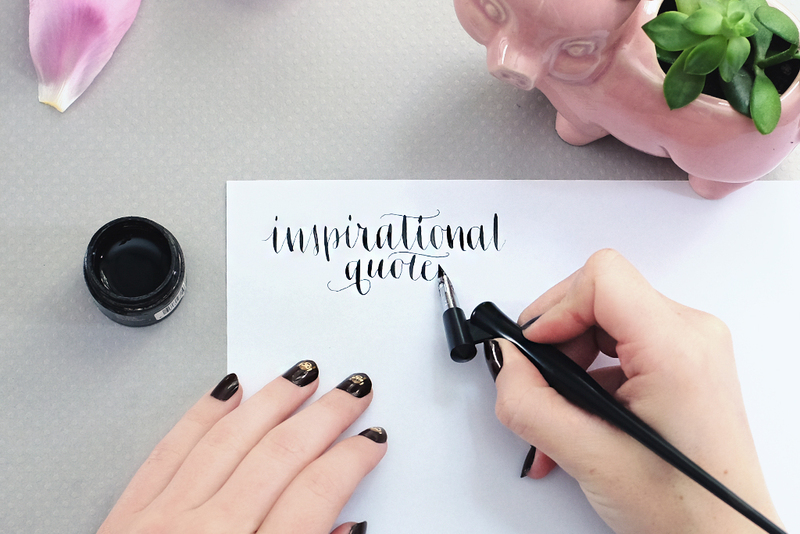 How effectively you use the ink determines the beauty of your lettering. There are various sizes available and generally, 0.05 is used for outlining while 0.08 is used for filling. Some of the popular brands selling felt pens are Micron, Staedtler, and Millennium. Brush Pens – Brush pens are essential due to their versatility of providing thick as well as thin strokes. It is used to fill up large spaces with patterns and there are soft and hard brushes available. Based on your comfort level, you should buy accordingly. Hard brushes are preferred for the beginners as they provide better control. Nib and Flat Pens – There are hundreds of nibs available and hence, different styles can be incorporated. Flat pens are also used extensively in lettering for quick sketching. There are different sizes available to choose from. Apart from these, you need to buy brushes to add texture to your lettering. You need to have all these items in your possession before you enroll in Skillshare lettering classes and become an expert if lettering designs.